I really need a holiday. With the weather being so nice, it's hard being cooped up in an office all day! This week is ever so slightly less hectic than the last which is good. 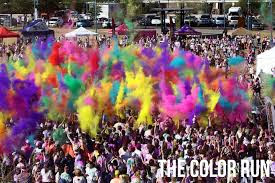 Color run is this weekend!! For some reason I thought I had loads of time before the race, but it's SATURDAY!!! It's Debbie, Leslie, Owen and I running. I sincerely hope that Debbie can make it. She mentioned that she might have a wedding. Because running in regular stuff is boring. Running in a tutu and derby socks while being turned in a human rainbow.... AWESOME!